Okay, I gotta say right up front here, this website is not for the kids, not work safe, and is probably not for everyone. While some folks might get a chuckle, get turned on, and/or enjoy it immensely, there's also a lot of regular readers of French Fry Diary who might be offended. I'm looking at you, loving enabling sister and caring mom-in-law, as well as quite a few others. Okay, you've been warned. Me, being secure with my own sexuality, and being a French fry fanatic - I think this site is a hoot. 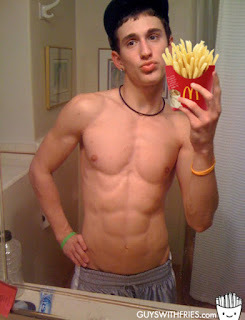 My Twitter friend @lisaluluquinn turned me on (not that way) to the Guys With Fries website, which features, well, hot guys holding fries, usually McDonald's French fries, ahem, among other things. Peruse at your own risk. I think it's great.